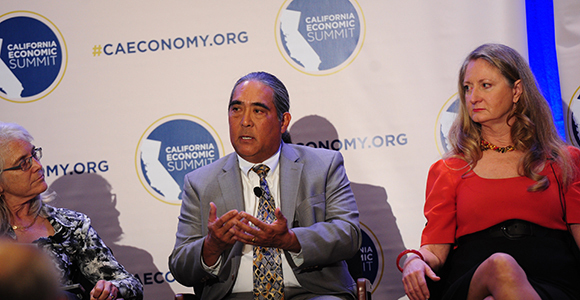 Co-presented by California Forward and the California Stewardship Network, the Summit brought together civic and business leaders from across the state to discuss how to move California along the path to prosperity. “Even before the drought, Californians were using more water than we had,” Ashley Boren of Sustainable Conservation. She said California needs to work toward finding a way to conserve, capture and reuse water at the regional level so that the state can return to a better water balance. Boren led a conversation with Celeste Cantú, manager at the Santa Ana Watershed Project Authority, Robin Gilthorpe of WaterSmart.com, A.G. Kawamura of Solutions from the Land and Jay Ziegler of The Nature Conservancy to discuss the state of water use in California. Cantú stressed the need for better water management from the time it drops in the mountains, all the way down to the end of rivers. But, Cantú said the goal will take much more collaboration between communities, which will necessitate the need for skills that participants in this space sometimes lack. “There is a need for soft skills, conversations and negotiations because the biggest need is for information,” said Cantú. “California is the fifth largest agriculture economy in the world,” said Kawamura, “We have to start thinking about the future. If we don’t act, then shame on us because we have plenty of examples. Kawarmura cited Israel and Aspen as areas that have more successfully dealt with water issues. Identify regional outcomes for integrated water management, which includes measuring and reporting. Connect headwaters and users and urban and rural communities. Also support regional efforts and innovations to conserve, capture and reuse water. Summit participants will now return to their regions to work on implementing the priorities in order to achieve the One Million Challenge Goal.